I just love the Serene Garden Bundle! Apart from the joy of the 10%, saving the stamp set and coordinating dies are really versatile. On a piece of Balmy Blue cardstock, I used Tranquil Tide ink to stamp in three of the corners and then used a Tranquil Tide Stampin' Write Marker to join up the lines to create a frame. I then watercoloured the leaves and stems with Lemon Lime Twist and Tranquil Tide inks. I stamped the large image again with Tranquil Tide ink onto Tranquil Tide cardstock and then used one of the coordinating dies to cut out some of the leaves, which I adhered into place on the card front. I stamped the flowers with Crushed Curry ink onto Daffodil Delight cardstock and watercoloured them with Crushed Curry ink before cutting them out with the coordinating die and adhering them to the card front. 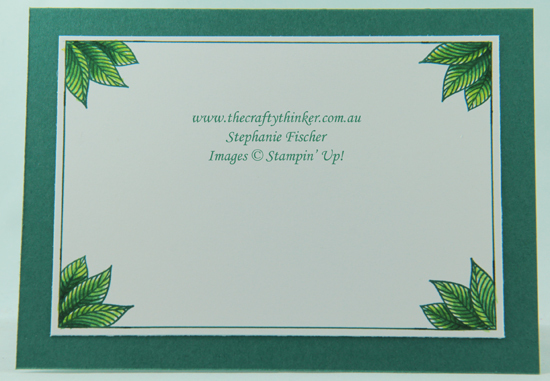 The greeting is from the Better Together stamp set and is stamped with Tranquil Tide ink. 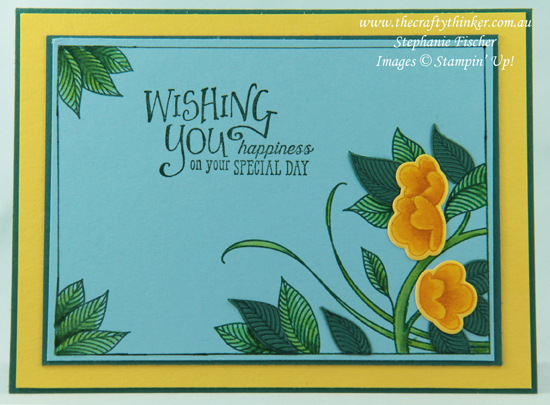 The card layers are Tranquil Tide, Daffodil Delight and Balmy Blue.